The JCI UK National Convention was hosted by JCI Southampton, over the weekend of Friday 24th - 26th November at the Grand Harbour Hotel. 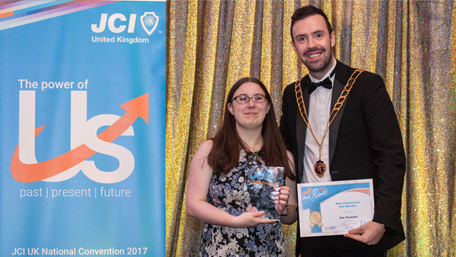 The JCI UK National Convention was hosted by JCI Southampton, over the weekend of Friday 24th –26th November at the Grand Harbour Hotel. Our Marketing and HR Executive, Zoe Toseland was part of the organising committee and E3 Consulting are Corporate Partners of JCI Southampton. The convention was a great success with over 120 delegates from across the country attending over the weekend. The weekend kicked off on the Friday, with a joint business day with Hampshire Chamber of Commerce, including an introduction from Hampshire Chamber Chief Executive, Maureen Frost and JCI Southampton President, Sophie Delaporte. The Business Day aimed to foster links with the local businesses, the community and the next generation of future young leaders. There were a raft of speakers discussing entrepreneurship, authenticity, leadership and overcoming impostor syndrome to name only a few. Speakers included Wayne Clarke from the Global Growth Institute on “How to be a World Class Manager”; coach Kate Atkin on “What is the Imposter Syndrome”; Donna Hubbard from Be Dynamic Coaching on “Authenticity: The key to unlocking our true potential” and Nutichef founder, Barbara Cox on her “Entrepreneurial Journey”. The convention also welcomed former Premier League manager Nigel Adkins, who spoke about motivation & managing people under high pressure; as well as the former Red Arrows Pilot, Andy Wyatt talking about his experiences and the importance of trust and teamwork. The weekend also included a masquerade themed Gala Dinner and JCI UK National Awards ceremony with 170 in attendance from the UK, Europe and further afield. E3 Consulting’s Zoe Toseland was awarded the Most Outstanding New Member, and the JCI Southampton Chamber were pleased to win seven awards in total including Most Outstanding Chamber, Most Outstanding Local President and Most Outstanding Member.